Fike scores on a wild pitch during Saturday's Wilson Tobs Varsity Classic game against Hillsborough Orange at Fleming Stadium. Fike junior Chad Bean worked five scoreless innings to get the win, his fourth without a loss, as the Golden Demons defeated Hillsborough Orange 6-0 in the Wilson Tobs Varsity Classic on Saturday at Fleming Stadium. Fike senior Myles Cyrus (2) scores the Golden Demons’ first run in their 6-0 victory against Hillsborough Orange on Saturday in the Wilson Tobs Varsity Classic at Fleming Stadium. Fike shortstop Zach Pittman, right, watches his throw to first base as Golde Demons second baseman Colton Moats circles behind him during Saturday’s game against HIllsborough Orange at the Wilson Tobs Varsity Classic at Fleming Stadium. Pittman tripled and Moats doubled for the Demons’ only hits in their 6-0 victory. Fike’s Chad Bean slides safely into third base on a fourth-inning double by teammate Colton Moats as Hillsborough Orange third baseman Joey Berini awaits the throw from the outfield during Saturday’s game in the Wilson Tobs High School Varsity Baseball Classic at Fleming Stadium. Bean was the winning pitcher as Fike prevailed 6-0. Some old-fashioned pitching and defense was enough to help Fike High bounce back from its only loss of the season as the Golden Demons blanked Hillsborough Orange 6-0 on Saturday afternoon in the Wilson Tobs High School Varsity Baseball Classic at Fleming Stadium. Junior right-hander Chad Bean fired five scoreless innings to notch his fourth win without a loss and senior Zach Pittman preserved the shutout with zeroes in the final two innings. Their pitching was backed up by errorless defense — especially helpful since the Demons managed just two hits. “Chad came out and gave us the start we needed and we played good defense behind him,” Fike head coach Buck Edmundson said. Bean, who threw 54 pitches, gave up two hits and walked none while striking out five in handing the 3-A Big Eight Conference Panthers just their second loss in seven outings. The lanky junior held Orange without a hit until Dante DeFranco led off the top of the fourth with a shot down the left-field line that Fike outfielder Mason Lee kept to a single with his hustle. The Panthers never really threatened until they loaded the bases with two outs on Pittman in the seventh before he struck out Tucker Miller to end the game. It was good to get a win considering that Fike, now 8-1, saw Southern Nash get a walk-off victory in the bottom of the seventh of their 3-A Big East Conference game Wednesday. 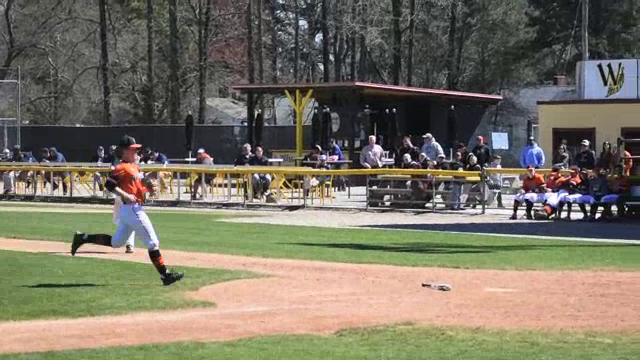 Pittman got it going early for Fike when he followed fellow senior Myles Cyrus’ lead-off walk with a triple that whizzed past Orange right fielder Colin Guentesberger. Pittman then scored on Garrett Browder’s sacrifice fly to left, giving Fike all the runs it would need. Orange starter Luke Riley (2-1) was the hard-luck loser as he left the mound after pitching a 1-2-3 second. Fike added to its lead in the fourth when the Orange defense found Fleming not to its liking. Bean reached on an infield error and second baseman Colton Moats laced a double just inside the left-field line. Edmundson decided before the game to give his team a chance to work on its “small ball” game, so left fielder Bryan Bunn was called upon to bunt. He laid down a perfect sacrifice to score Bean. The throw to first was wide and Bunn scampered to second while Moats scored. Things got worse for Orange in the fifth when Browder’s towering fly ball to left to lead off the inning was dropped for a two-base error. The next Fike hitter, Tanner Sullivan, struck out on a ball in the dirt but reached first safely when it skipped past Panthers catcher Tucker Joseph. Browder eventually scored on another wild pitch and Sullivan scooted home on a double steal that ended in another Orange miscue. Junior third baseman Hunter Stokely missed his third straight game with “a little bit of a strain,” Edmundson said. He is out indefinitely. While Stokely’s bat will be missed for the time being, Edmundson hopes his team will take Saturday’s small-ball exercises to heart. WP-Chad Bean (4-0) 5 IP, 2 H, 0 R, 0 BB, 5 SO. LP-Luke Riley (2-1) 2 IP, 1 H, 2 R, 2 ER, 1 BB, 1 SO. LEADING HITTERS — Orange: Dante DeFranco 1-3, SB; Cooper Hench 1-3, 2B. Fike: Zach Pittman 1-3, 3B, R, RBI; Colton Moats 1-2, 2B, R.